South Africa has started distributing anti-retroviral (ARV) drugs to Aids patients in public hospitals, health officials have said. Hundreds of people have been queuing in hospitals across Johannesburg for tests before getting the drugs that help suppress the HIV virus. Gauteng province health services spokesman Papa Maja told the BBC the exercise began in five hospitals. 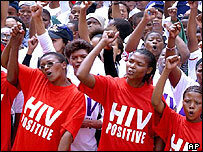 South Africa has highest number of HIV positive people in the world, some 5m. Opposition parties say the timing of the roll-out, just two weeks before general elections, was designed to win votes for the ruling ANC. Aids activists have been campaigning for years, urging the government to provide these drugs. "My feelings are that it's really about time, but sadly way too late for a lot of people in this community", volunteer worker Cora Bailey told AP television. But for one Aids sufferer, Jimmy Mileya, the roll-out is better late than never. "The government should have released the treatment a long time ago to help other people who are in the same kind of situation as I am, but I still say it is better that they have now." Mr Maja said patients would have to have an Aids test and show symptoms of severe infection before the drugs are distributed free of charge. He said the exercise is being conducted at the Chris Hani Baragwanatha, Kalafon, Helen Joseph, Coronation and Johannesburg Hospitals. Lobby group Treatment Action Campaign (TAC) had threatened to take legal action against the government for delaying the distribution of the drugs. It however put its plans on hold after Health Minister Manto Tshabalala-Msimang announced that the programme would begin this month. 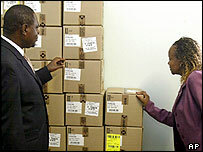 President Thabo Mbeki's government last year agreed to distribute ARVs but it has taken several months to put the policy into action. TAC says only 2,700 people received anti-retroviral drugs by the end of March, far short of the government target of 53,000. One province, the Western Cape, was so fed up with delays at the national health ministry that it began its own treatment programme earlier this year. Officials say 50,000 people could be receiving ARV drugs by the end of this year. "The South African government has been criticised for not acting quickly enough"